1 On the third day Esther put on her royal robes and stood in the inner court of the palace, in front of the king’s hall. 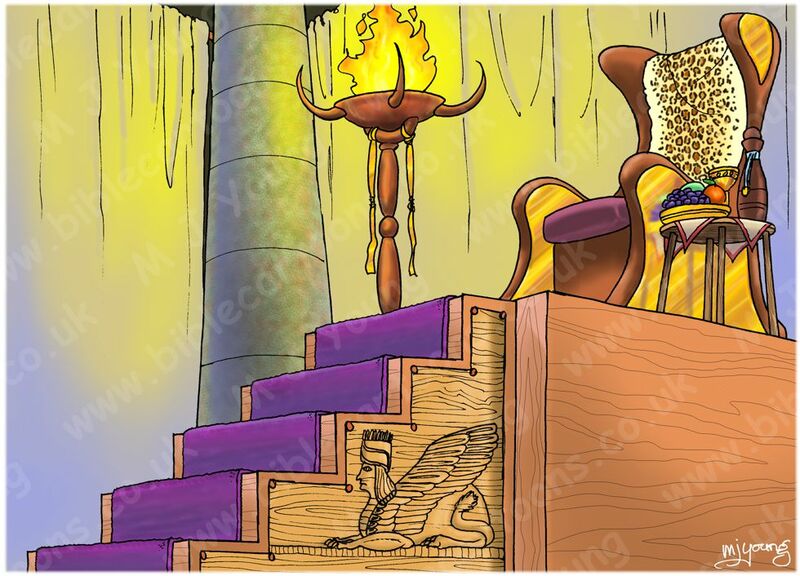 The king was sitting on his royal throne in the hall, facing the entrance. 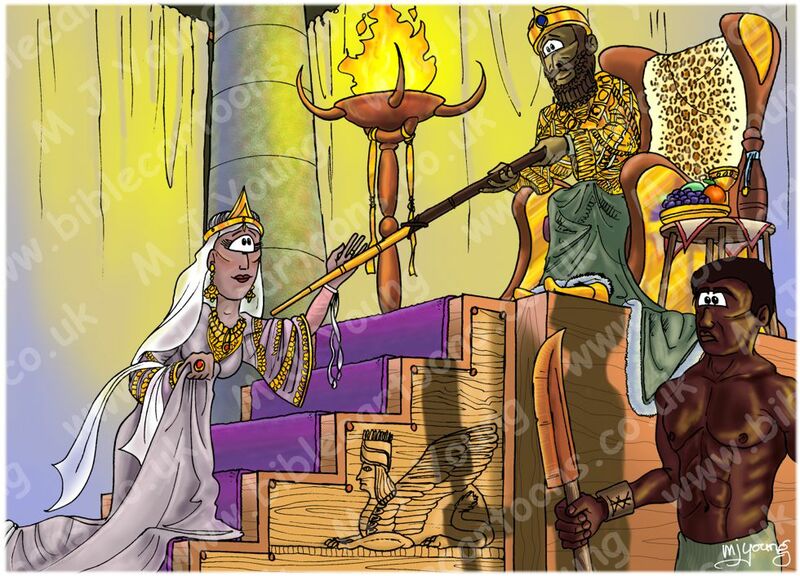 2 When he saw Queen Esther standing in the court, he was pleased with her and held out to her the gold sceptre that was in his hand. So Esther approached and touched the tip of the sceptre. The primary light source for this scene is the large flaming torch bowl in the upper middle of the picture. There is a second, dimmer torch off to the right of the scene, which is highlighting the guard & casting his shadow onto the steps leading up to Xerxes throne. Esther, kneeling on the wooden & carpeted steps leading up to the king’s throne. 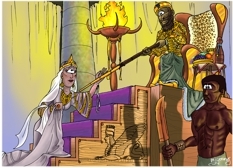 Xerxes, extending his gold tipped sceptre to Esther, his queen. A guard, in the right foreground of the scene. I toyed with the idea of drawing a lot more dignitaries & palace officials behind Esther. Certainly there might have been many more people in the king’s throne room with him. But for the sake of the scene I have omitted them. I think the “quiet” area of wall tapestry behind Esther serves to focus the views attention on the scene on the steps, rather than detracting from it. I am very pleased with the subtle colours of the wood in this scene. The carved sphinx-like character on the wooden stairs came out particularly well I think. I am also pleased with the guard colouring & his shadow falling across the steps. Notice also the red, green & blue stippling effect used to portray the great column in the background of the scene. A note about the gold sceptre. What was all this gold sceptre waving about?! 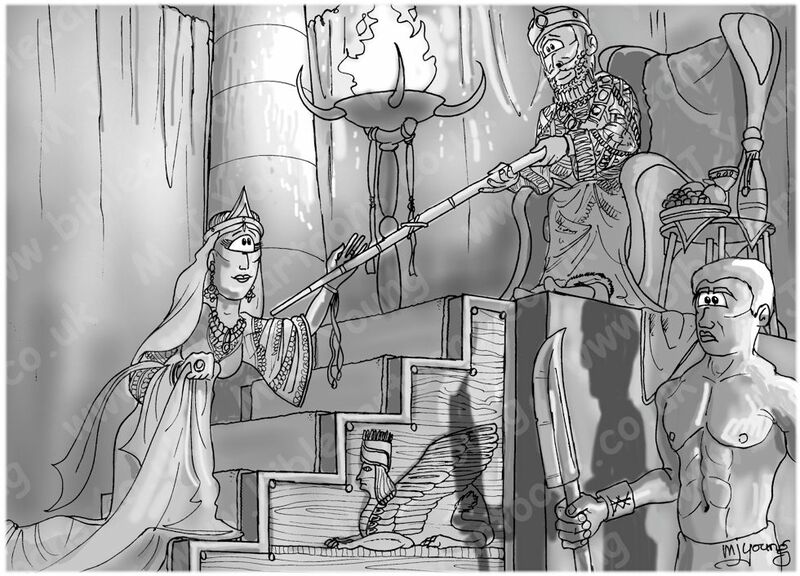 Had the king failed to lift his sceptre, according to the law of the Medes 7 the Persians, she would have been executed. So, by agreeing to go unbidden into the king’s presence, in his royal palace, Esther was literally putting her life on the line. It [the gold tipped sceptre] was extended to Esther as a token not only that her intrusion was pardoned, but that her visit was welcome, and a favorable reception given to the suit she had come to prefer. touched the top of the sceptre — This was the usual way of acknowledging the royal condescension, and at the same time expressing reverence and submission to the august majesty of the king. When she stepped into that royal court and waited — it was certainly a dramatic moment — the king looked at her. The question is: Will he raise the sceptre or will he not? And in that moment I am confident this Hebrew girl prayed, although there is no record of it. She must have recognized how helpless and hopeless she really was. And then the king held out the golden sceptre to her, and possibly smiled. Then she advanced and put her hand on the sceptre, which was the custom of the day.